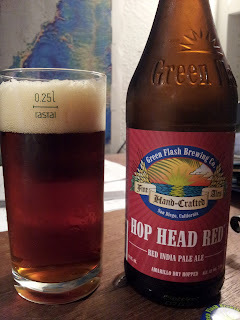 I don't have a clue what a "red IPA" is, but what I assume it to be -- given Green Flash's hoputation -- is a deep red ale (think full body and heavy bitterness) taken to a new level with a fucktuple of hops, including a dry hop for aromas. There's a big hop blast (heavy on the bitter of course) mixed with a deep caramel/brown-sugar finish, and some classic aromas which, when taken collectively, will knock the dust off that palate, to be sure. It's safe to say this is my favorite beer from San Diego's Green Flash. I've enjoyed watching them evolve and try new styles (e.g. Rayon Vert), but this is spot on in the Hell Yeah! department. It's unique, well done, delicious, and strong: the makings of a great beer.